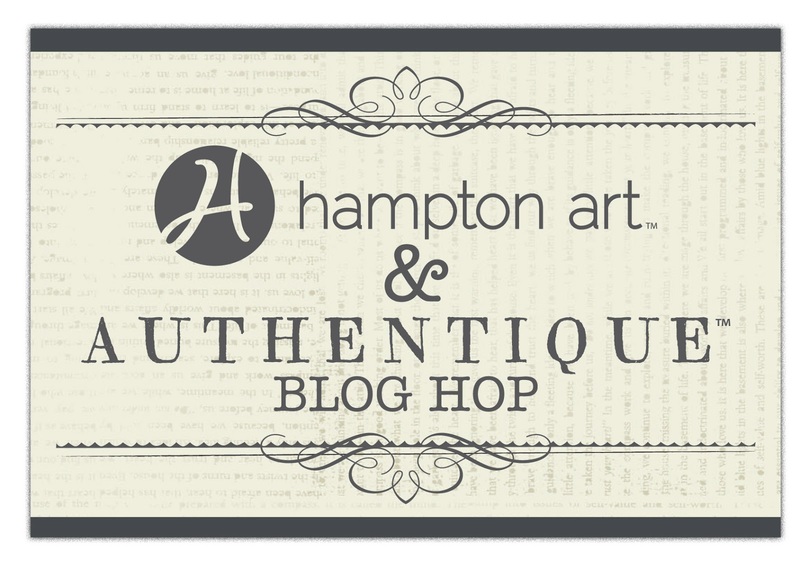 Hampton Art Blog: Hampton Art/Authentique Blog Feature Week! Welcome to another fun filled week of Giveaways and sharing of great projects! This week we are featuring our partner Authentique! Hampton Art partnered with Authentique to create their licensed designs into great quality stamps! Make sure you check out our blog and the Authentique blog all week long! Leave comments each day for chances to win a great package of Authentique branded stamps from Hampton Art. We will pick a winner next Monday from the daily comments on the blog. Today we feature a project created by Hampton Art Design team member, Britt Bass. Hello there! Britt Bass here today to share a fun and "fancy" card using Hampton Art liscensed stamps (Authentique and Echo Park) and Clearsnap chalk ink. When I first saw the stamps that coordinate with the Echo Park "Oh Snap!" line I fell in love with the doily image! I really wanted to showcase it. So I used here, twice, as my background and as an embellishment. I stamped the sentiment and mounted it and the blue die cut with foam squares. The little boy and girl image from an Authentique set have some extra movement when they are coupled with the arrow stamp from the Echo Park set. I finished everything off by adding some little embellishments grouped around the sentiment and a pretty pink bow. Such a cute card! I love the boy/girl image! Love this card. Good stuff!!!!! Absolutely delightful projects! Love the Hampton/Authentique team! Can't wait to order the stamps! Looking forward to the rest of this week...should be awesome! I love that doily too! Love this card! 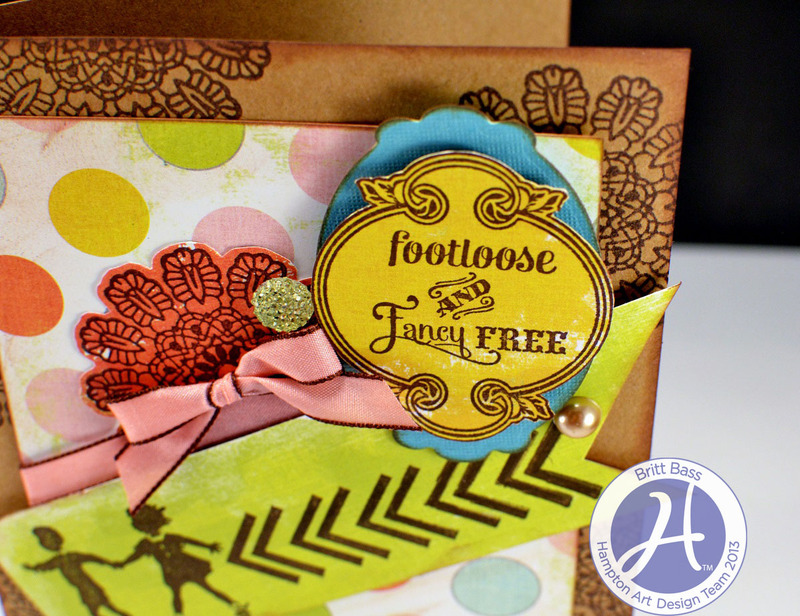 love the footloose stamp. it makes me smile. Very cute card. Great idea to use the doily for the background and as an embellishment. Well done! Love that ribbon you used too. 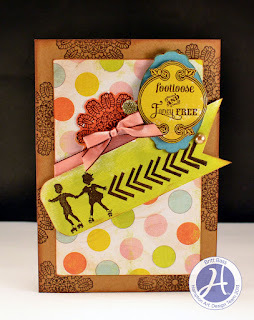 Very fun and playful--I like the doily stamp. Cute card ! Love the colors. And the doily stamp. What a cute card! I LOVE that doily stamp and the little kids roller skating? Just darling! Great card. Doilies are so useful. And you made good use of one on this card. Thanks for sharing. Oh how adorable. I love those kiddos skating! the doily looking images look very cute. I also like the kids roller skating. It's really cute. Fabulous and fun project! Thanks for sharing your design ideas. Lovely bright fun colors! Love the stamped images too. 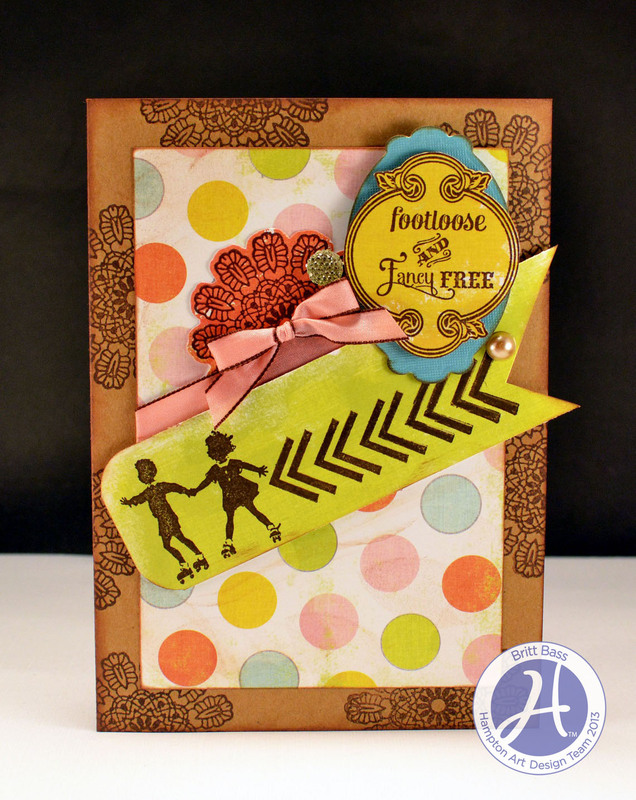 So fun, the stamped Kraft background is awesome! I love this combo!! Authentique papers are outstanding and Hampton Art stamps are the best! Please make stamps that go with their Christmas line - that would be heaven! this is a darlin card....glad to see you guys pairing up...yeah! Wow...I am loving the colors used, that lace stamp along with those other fun ones...LOVE..Love..love. Super fun card with all those bright colors and fun patterns. And I LOVE doilies, so this stamp is a winner! VERY fun card! The skating kids with chevron arrows really does give a feeling of "wheeeeeeee!". Oh the color combo is wonderful! Beautiful card! Adorable card Britt! I love the colors you used and that doily background! That skating image is one of my favorites of these new stamps - it is so cute!!! I am loving that Hampton Art has teamed up with some of my favorite "paper companies" to bring us new stamps to play with! Thanks for sharing! This sentiment is perfect to use with the silhouetted children. Nice color combo. Great card. Fun card! Love the colors and the cute little skaters!